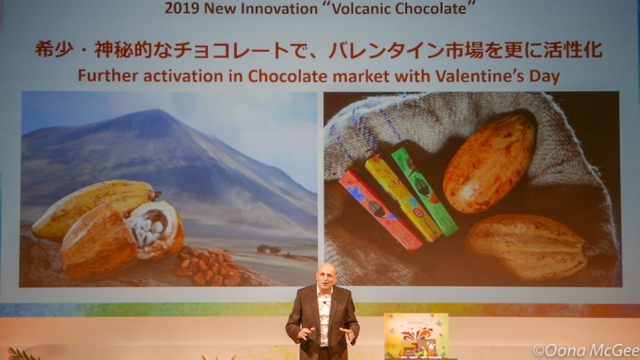 After snaring exclusive rights to the world’s first ruby chocolate last year, Nestlé Japan has been continuing their pursuit for the world’s rarest chocolates, and this year they’ve really outdone themselves, with the announcement of a brand new collection featuring volcanic chocolate. 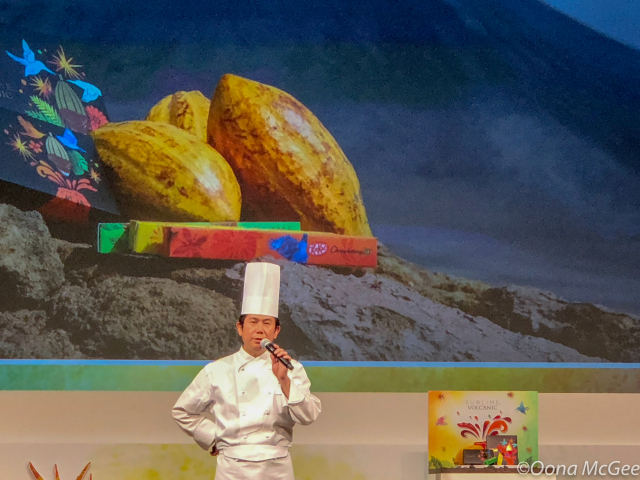 According to Lacroix, Nestlé is always looking for new experiences in the world of chocolate, and less than eight months ago they came across some very specific cocoa beans growing on volcanoes on very small islands. These beans, grown on rich lava soil, give chocolate a very specific and unique taste, and they’re also incredibly rare, as they account for a mere 0.2 percent of the world’s chocolate. Firetree Chocolate, a super premium chocolate company which sources the highest quality beans from small estates, is working with Nestlé on the new collaboration. 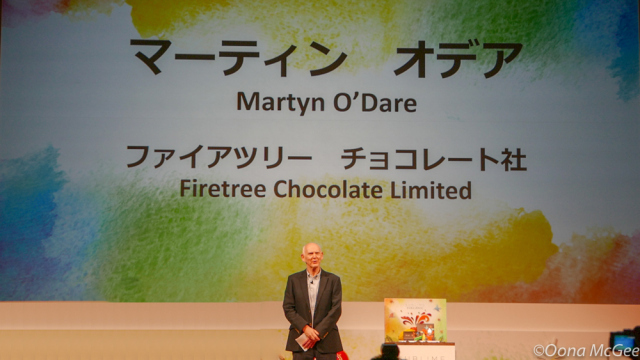 ▼ Martyn O’Dare, the owner of London-based Firetree Chocolate. O'Dare has spent most of his life manufacturing chocolate and buying and processing cocoa, working mainly with West African and Central American cocoa. Over the years, though, he would occasionally come across a spectacular-tasting bean, and this curiosity for the bean and its unique flavor led him to its home of Papua New Guinea, Vanuatu, and the Philippines. These three countries account for less than 1.5 percent of the world’s cacao production, and of this, only a small percentage are of a high enough quality to produce chocolate, as many beans are simply grown quickly for cash. O’Dare was fortunate enough to meet up with an Australian government group charged with supporting the regeneration of farming, including cocoa farming, in these islands, which helped to open the way for trade. O’Dare spent a month travelling through small volcanic islands in these countries, meeting over a hundred farmers and ensuring that the growing, harvesting, fermenting and drying processes were of the highest standard. 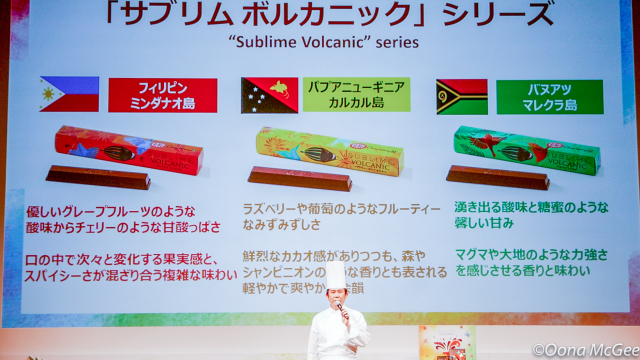 As a result, Firetree and Nestlé are now working together with farmers on the volcanic islands of Karkar in Papua New Guinea, Malekula in Vanuatu, and Mindanau in the Philippines to produce chocolate for the new Sublime Volcanic KitKats. 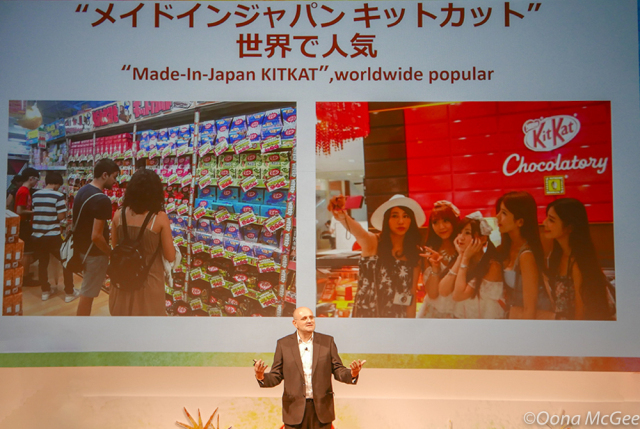 O’Dare says the farmers on these small islands are incredibly excited to be working on the new KitKat project and sharing the flavour of their unique beans to people around the world. And with renowned Japanese patissier Yasumasa Takagi at the helm for the new release, it’s guaranteed to be a well-balanced and carefully crafted premium chocolate. Takagi has been creating exclusive KitKats, like last year’s Ruby Chocolate, for a number of years. Takagi also travelled abroad to meet with farmers growing the rare cocoa beans. The rich soil in which the trees are grown give the beans a flavor profile unlike any other, and Takagi wanted to capture the unique taste of the terroir produced from the energy and magma deep beneath the surface of the Earth. The Sublime Volcanic series comes in three different varieties, all showcasing the “Taste of the Earth” generated from the three different volcanic islands. 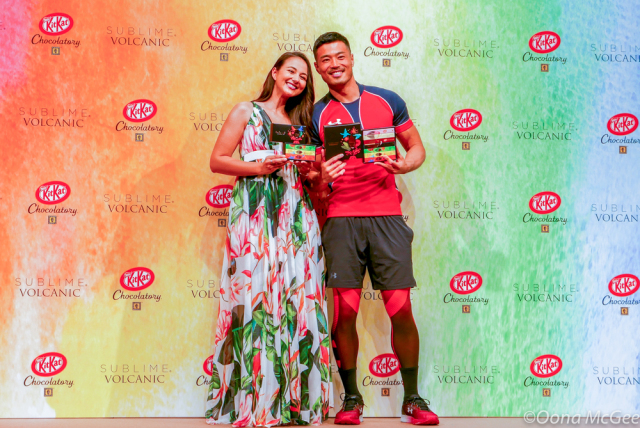 Nestlé is introducing the new product range as an ideal gift for Valentine’s Day, so loved-up couple Akihito and Laura Yamada were on hand to bring all the feels to the event. 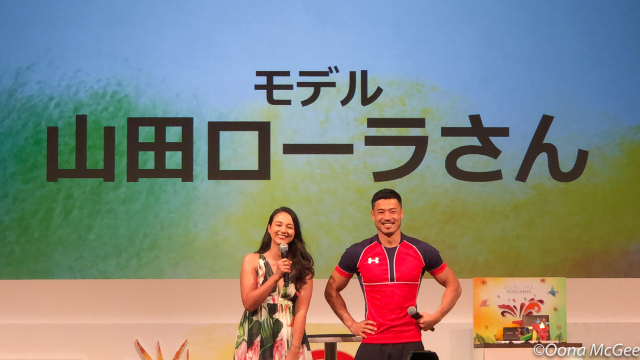 The Japanese rugby union star talked about how he felt when he first met his half-Japanese half-American model wife, and the two shared their plans for Valentine’s Day with the assembled press. And when we got to lay our eyes upon the new range, we weren’t disappointed. The new bars can be purchased separately for 400 yen each, in gift packs of three for 1,300 yen, or as part of a seven-piece box, which includes bitter, milk, white, and ruby Sublime chocolates, for 2,600 yen. The beautiful boxed packaging comes adorned with images that pay homage to the rare cocoa bean ingredient and the pacific island home from which it’s sourced. 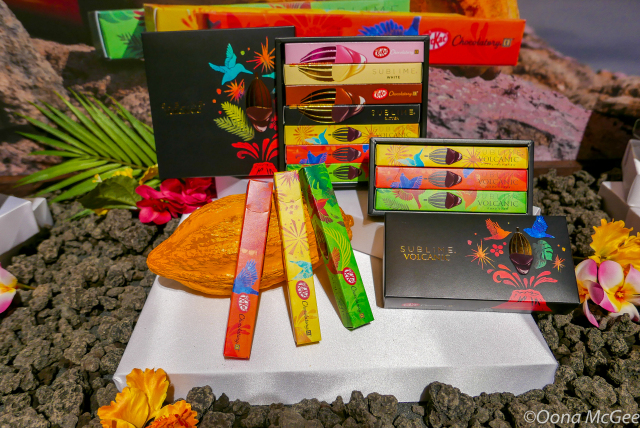 The Sublime Volcanic KitKats are on sale at Chocolatory stores and will become available to purchase online and at 50 pop-up shops around the country from Friday.